Let’s face it-kids love candy. 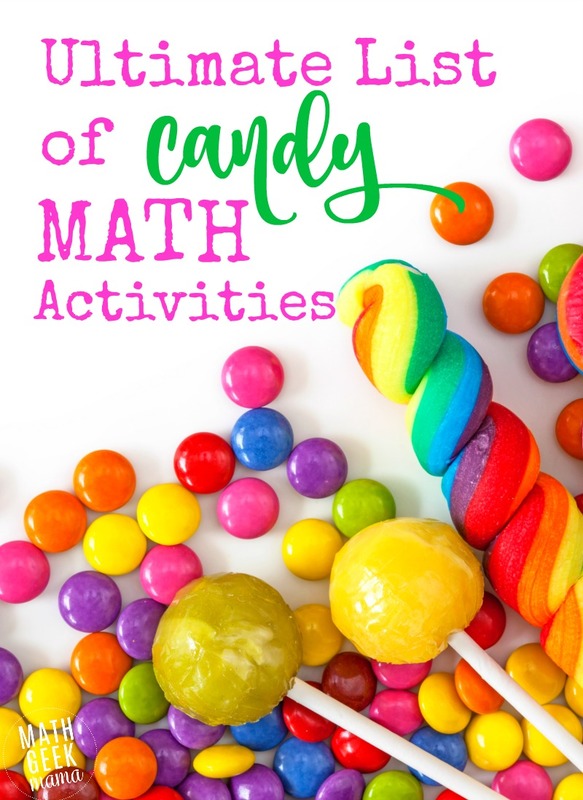 And while we, as the adults, have to make sure they don’t go overboard with the sweets, it can be a fun treat from time to time and can certainly make difficult math concepts more fun and engaging. Plus, doing some candy math with your kids can also be a great way to make good use of all the piles of candy at Halloween or Easter. 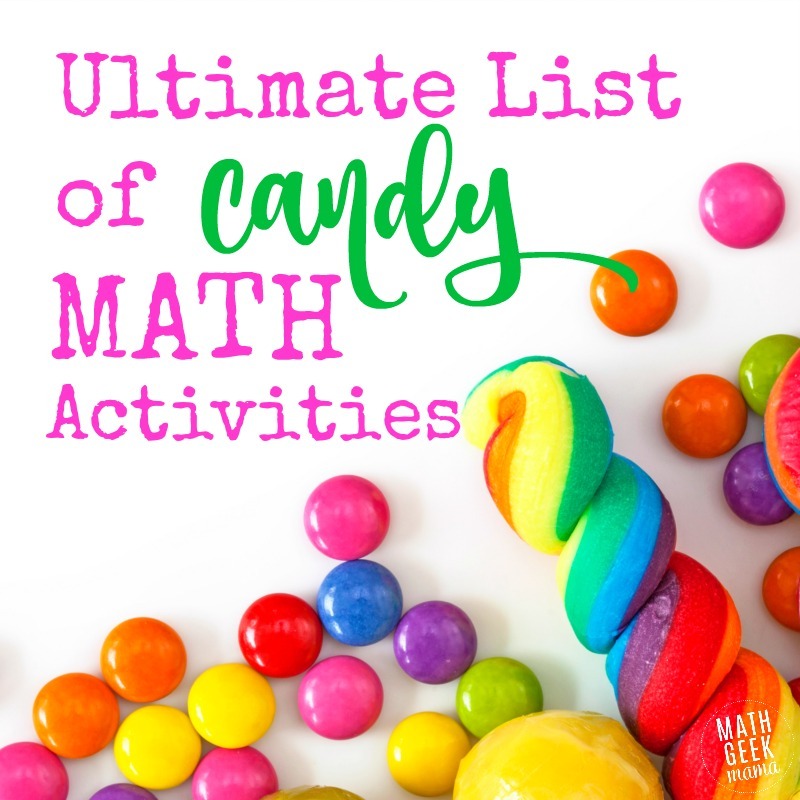 Whatever the occasion, you will find all sorts of candy math activities in this list, as well as fun candy math books to read. There’s something for everyone! Candy Corn Counting Puzzles: Make counting practice with this set of printable puzzles. More Candy Corn Math: If you can’t get enough candy corn math, this printable set includes a variety of math games and activities using candy corn pieces. Skittles Patterns: Make and extend patterns with Skittles candy. This free printable pack will get you started. Count & Compare Skittles: Who has the greatest number of skittles candy? Easily count and compare numbers with this free printable set. Skittles Graphing: Count and graph the total with this Skittles math activity. 100th Day Hershey Kiss Hunt: This is such a fun activity for Kindergarten on the 100th day of school! Weight & Balance with M&Ms: This is a fun, hands on activity to help kids understand equal, weights and measures, etc. Candy Math Printables: This post includes several different math activities for grades K-3, including measurement, graphing and word problems. M&M or Skittles Math: These pages are great because they can be used again and again with different amounts of candy and they cover a variety of math skills. Halloween Candy Graphing & Data Collection: This set of printables is a fun way to learn math with your Halloween candy stash. Candy Multiplication: This hands on activity was used with the book, 2×2=Boo! but you don’t have to use the book to explore multiplication. Skittles Fractions: Help your kids understand fractions with Skittles candy. Play Candy Shop: I love this cute idea! Working with money incorporates so many math skills, and is necessary for life in the real world. Learn how to set up a play candy shop in this post. Fractions with Hershey Bars: This includes a free printable set of task cards to help kids write fractions and add fractions with Hershey’s chocolate bars. Candy Challenge Game: This online game is a fun challenge for kids. There are 18 levels of challenges. Learning About Decimals with M&Ms: Help kids understand decimal place value with this hands on lesson. Probability with Skittles: This lesson is great for teaching kids about probability and odds. And of course, it uses one of my favorites-Skittles candy! Candy Bar Volume: This fun measurement lesson helps kids learn about volume and the volume formula. Scaling Up Candy Wrappers: This is such a fun project for middle school. Kids choose a candy wrapper and use a scale factor of 5 to make a larger version. Solving Equations with Gummy Bears: Help kids learn how to balance and solve equations using gummy bears. Candy Hearts Tower: This super simple challenge will keep your kids busy to hours! How tall can they build their candy heart tower? Can they make a pattern? SO many possibilities. Jelly Bean Structures: What can your kids build with jelly beans and toothpicks? Try this fun engineering challenge. Jelly Bean Peep Nest: Can you build a nest for your candy peep? Another super simple challenge with just a few materials needed. Build a Gumdrop Bridge: This is another great and low prep challenge for kids. Build a Candy Dispenser: If your kids love LEGO, they will love this fun challenge. Candy Corn Catapults: This is a fun challenge for Fall, or really anytime of year with the candy of your choice! Floating M Experiment: Can you remove the ‘m’ from an M&M? This is a must try experiment for kids! Life Saver Light Sparks: Kids will love testing this out-see sparks of light in your mouth as you crush a lifesaver. What candy math ideas would you add to this list? Share in the comments!